Organised in cooperation with the Bulgarian Ministry of State Administration and Administrative Reform. Organised with the support of AINOVA. 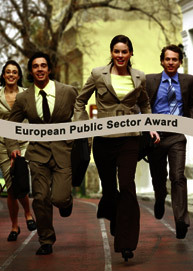 Organised in cooperation with the Catalan School of Public Administration (EAPC). Organised in cooperation with the National Agency of Civil Servants, Central Unit for Reform within Public Administration and the National Institute for Administration. EIPA conducted an information day in a joint venture between EC - DG Employment and the Committee of Regions.